Old Fashioned Candy sticks in Halloween colors and shapes. Designs included are Pumpkin, Frankenstein, Mummy, Halloween Ghost, Haunted House and Candy Corn. 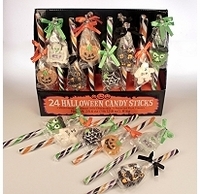 Each candy stick is a fruit flavored and is decorated with a jelly Halloween shape. These are perfect for handing out for Halloween or for a treat at your Halloween party. Each box has 24 candy sticks approx 8 inches long.